A few days ago, I replaced one of the four hard drives of my server using the now abandoned operating system OpenSolaris (cf. Replace disk on OpenSolaris). action: The pool cannot be imported due to damaged devices or data. This discussion is talking about a similar problem linked to a replaced disk which was a bit smaller than the other ones. Repartition the disk to have the exact same number of cylinders using format -e c3t3d0s4. Reimport the raid pool ‘dpool’ using the command zpool import dpool. That’s it! 🙂 From that point, I tried to reboot the server multiple time and the pool is still working fine. I’ve bought six years ago, in April 2008, a Sun Ultra 20 M2 Workstation, Dual-Core 2.6 GHz AMD Opteron Processor – Model 1218. 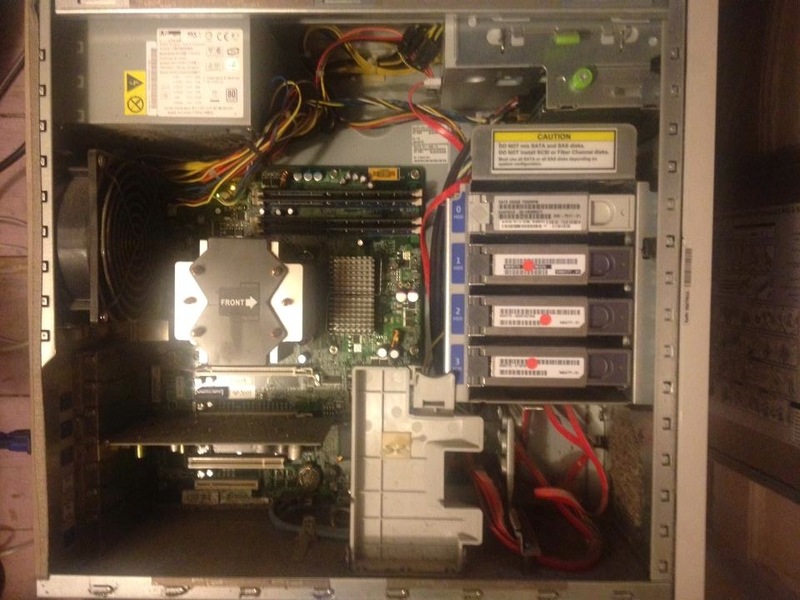 The server contains four hard drives of 250Go and I installed the now abandoned operating system OpenSolaris. On top of that, I used software RAID and virtual storage pools offered by ZFS. The choice for that was mainly because this server doesn’t have any hardware RAID card. You can also see above that one of the disks (c3t3d0) doesn’t seem to work any longer. This is the faulty disk which needs to be replaced. The first thing I did was shutting down the machine and replacing the physical disk. Once I’ve done that, I simply reboot the machine. This error means that the disk slice doesn’t have any disk space allocated to it or possibly that a Solaris fdisk partition and the slice doesn’t exist on an x86 system. Use the format utility to allocate disk space to a slice. If the x86 system doesn’t have a Solaris fdisk partition, use the fdisk utility to create one. This is pretty clear, I installed the new drive but I didn’t partition it. Using the table below and the article Mirroring my Solaris OS partition, I manually recreated the partition table on the new drive. This seems to be working, we can see below that the system is rebuilding the data on the new drive. So far, I was using Samba to share the files stored on my D-Link DNS-323. However, people tend to say that NFS is quicker than Samba. So let’s benchmark those two protocols and figure out which one is actually quicker. I used IOzone to benchmark these protocols from the Raspberry Pi. You can find the package for Arch Linux ARM on one of my previous post. I first mounted the Samba and NFS share drives in the two respective folders /mnt/storage_smb and /mnt/storage_nfs. You can download the output files here and here. As you can see, it looks like NFS is quicker for read operations but slower for write operations than Samba. But please remember that this is true for this very specific configuration ; It could be completely different for another one. In conclusion, I personally decided to use both Samba and NFS depending of what I need. If I need a read only access to my data, I use NFS. However, if I need to write data, I use Samba. Encryption is a very important subject in computer science which developers need to deal with quite often. I already wrote a few years ago an article containing some code to encrypt data with PHP and decrypt it with Java. I will give you this time the code to encrypt and decrypt data with the same language: Java. Once again, I used a secret key and an initialization vector for the encryption and decryption. * This class provides methods to encrypt and decrypt data. Some time ago, I bought a Raspberry Pi. I am not going to describe what it is here, but you can read more about it on this page. But this list didn’t help me much. Indeed, out of them, which one should I buy? As you can see, the speed of the first one is 95MB/S against 45MB/S for the second one. Does it mean the Raspberry Pi will run twice quicker? Let’s check it by benchmarking the cards. I used IOzone to benchmark these cards. Unfortunately, IOzone is not available for ARM on ArchLinux. I wrote a separate article about it. The full output can be found here. So, it looks like the difference is not that big. Indeed, the SD card with a speed of 95MB/S is not twice quicker than the other one. Why is that? In my opinion, this is directly linked to the actual speed of the SD card reader within the Raspberry Pi. Which means that it doesn’t matter which card you are using, you won’t go further than 22MB/S anyway.